This dish is easy to prepare and takes less than 30 minutes, perfect for a weeknight supper. Yet it’s also fancy enough for preparing for company. I’ve prepared it several times for my friends and family! Simple and Delicious weeknight meal. Juicy white chicken breast topped with a tomato, cream, and basil sauce. 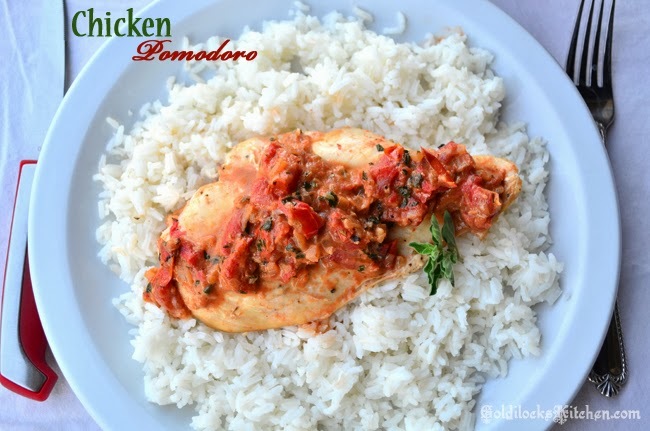 Chicken Pomodoro is a great teaching dish for beginners, as it uses all fresh ingredients. 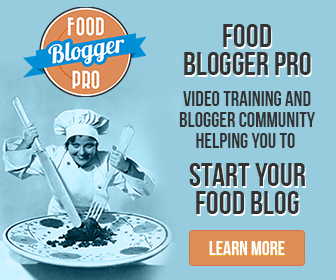 There is just no comparison for food created with fresh ingredients. The Chicken breast meat is patted dry and lightly seasoned with salt and pepper, then cooked in a saute pan until deep golden on both sides. This step is not to cook the chicken through, but to create fond, the little brown bits on the bottom of your saute pan. These little bits are full of flavor and help to give depth to pan sauces. You’ll finish cooking the chicken in the prepared sauce at a later step in the recipe. mixed with the onion? That’s the fond! Here, the ingredients are used to build a chunky pan sauce, and then the browned chicken is braised in the creamy mixture with a little kick of red pepper flakes. When cooking this recipe, prepping all ingredients beforehand is a must. It goes fast, and you won’t have time to be chopping up veggies and herbs and cooking at the same time. Quick Italian Chicken with a kick and loads of flavor. One pan recipe that cooks chicken in a flavorful sauce consisting of oregano, roasted tomatoes, fresh basil, cream and red pepper flakes. Pat chicken dry with paper towels. Using a sharp knife (preferably a chef's knife) slice each breast horizontally in half. It's easiest when you place you hand, fingers close together, flat on top of the meat to secure it and slice through the meat horizontally with your knife, under your hand. You should have 4 total breast shaped cutlets approximately 1/2 inch thick. heat 1 tablespoon of the olive oil in a large skillet or saute pan over medium-high heat until just smoking. Cook chicken until golden, about 3 minutes per side. Transfer to a plate. Heat the remaining two tablespoons of olive oil in the empty skillet over medium-high until the oil has spread out over the entire bottom of the pan. Cook the onion until softened, about 5 minutes. 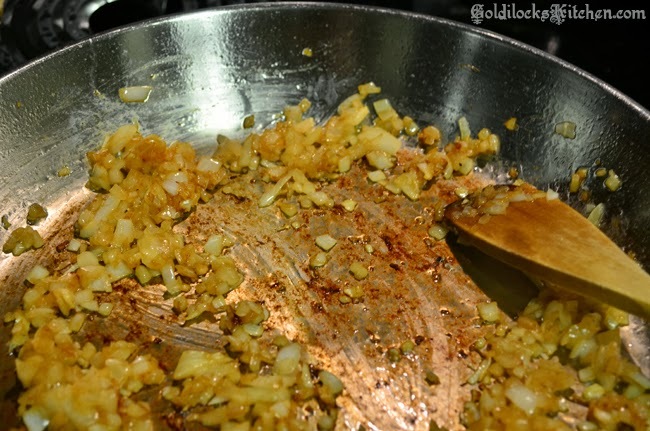 Add the garlic, oregano, and pepper flakes and cook until fragrant, about 30 seconds. 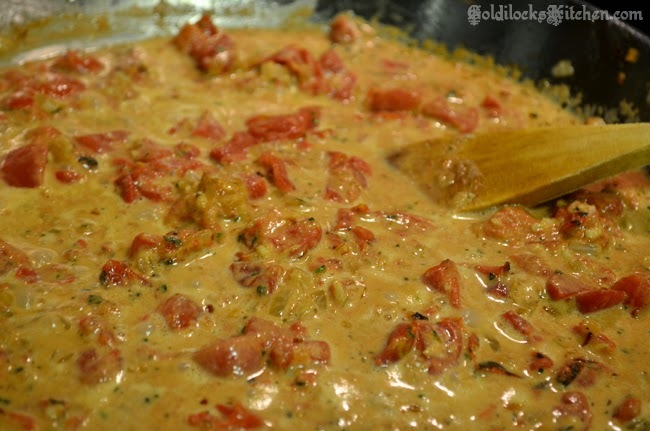 Then stir in the tomatoes, cream and 1/4 teaspoon of salt and bring to a boil. Nestle the chicken and any accumulated juice into the pan. Simmer, covered, until the chicken is cooked through, about 8 minutes. Transfer chicken to a platter and tent with foil. Simmer sauce, uncovered, until slightly thickened, about 5 minutes. Off heat, stir in the basil and season with salt and pepper as needed. (Don't forget to always TASTE your sauces before serving, and add salt accordingly.) 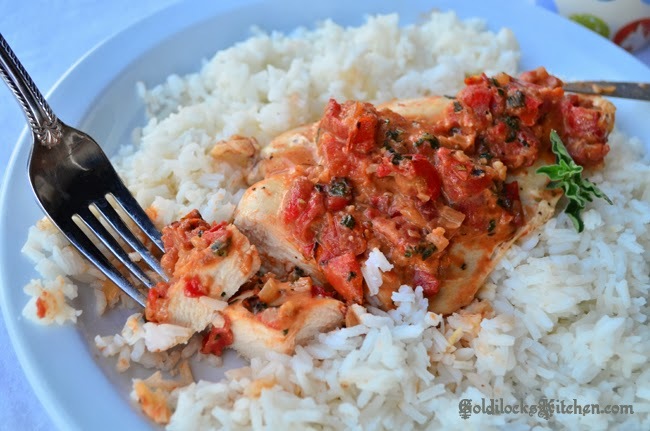 Pour finished sauce over chicken and serve over your choice of rice, pasta or even polenta!